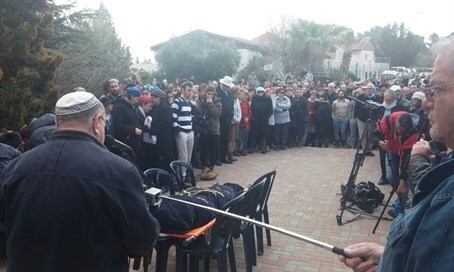 Mother of six stabbed to death by Arab terrorist at her home in Otniel brought to final rest in Jerusalem. Around 2000 people took part in the funeral procession that began on Monday morning for Dafna Meir, who was murdered the night before at the entrance to her home in Otniel, in the southern Har Hevron region of Judea. Meir, 39, worked as a nurse at Soroka Hospital in Be'er Sheva, and was a mother to six including two adopted children. She fought with the Arab terrorist who stabbed her at the entrance of her home, and prevented him from murdering three of her children who were inside at the time. The terrorist, who apparently worked in the town, remains at large. Meir's funeral procession headed out from Otniel at 9 a.m., and arrived at Har Hamenuchot Cemetery in Jerusalem's Givat Shaul at around 11 a.m., at which time she was buried. Efrat Dahan, a friend of Meir, eulogized her at the start of the procession in Otniel. "What have we lost, an achot (nurse or sister in Hebrew - ed.) not only in her profession but in her heart and soul, my beloved Dafna, we met each other four years ago when I arrived in the town and I sat a while in the playground, we got to know each other and started to speak about the most personal things, it was so nice for me that we became good friends immediately and forever," said Dahan. "I was able to talk with you about everything, you knew so much." Aside from her four children Ranana (17), Ahava (10), Akiva (15) and Noa (11), as well as her two adopted children Yair (6) and Yaniv (4), Meir also leaves behind her grieving husband Natan. Ranana, eulogizing her mother at the cemetery, said, "you left us with a great empty space. We won't drink tea together. You won't accompany me to the huppah (wedding canopy - ed. ), to Bakum (the IDF enlistment base - ed. ), to the birthing room. Sorry I couldn't help you in the most difficult moments." An initial investigation of the attack indicates the terrorist arrived at her home on the northern edge of the town as Meir was painting her front door, with three of her daughters inside on the ground floor. The terrorist pounced on her with a knife and the children, having heard their mother's shouts, came upstairs where they witnessed her murder. After the terrorist fled the scene, Ranana called her father and informed him of the attack. Initially she told him her mother was seriously wounded as relayed by medics, but after several minutes as the enormity of the attack became clear, she broke into tears and explained to her father that her mother had been pronounced dead.